House Speaker Nancy Pelosi (D., Calif.) requested Wednesday that President Donald Trump delay his State of the Union Address until after the federal government shutdown ends or submit his address to Congress in written form. 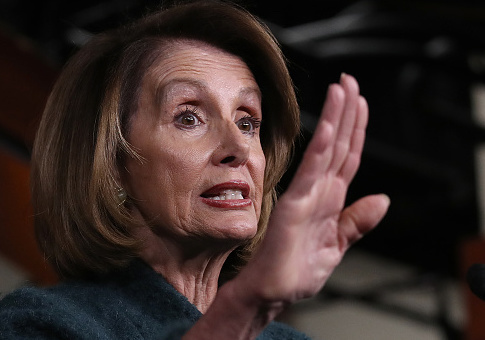 Pelosi's request comes amid an almost month-long partial government shutdown spurred by a debate between Democratic lawmakers and the Trump administration over funding for border security. Pelosi informed Trump in a letter that because the event would require the "full resources of the Federal Government to be brought to bear," as it was designated aa national special security event in 2018. According to Pelosi, it would be inappropriate for Trump to deliver a speech without the government completely open. She also wrote that in modern times, "the State of the Union has never been delivered during a government shutdown." The speaker added, however, that it was custom until the time of President Woodrow Wilson for presidents to deliver the State of the Union to Congress in letter form. Pelosi said Trump is free to follow suit, if he wishes. "Sadly, given the security concerns and unless government reopens this week, I suggest we work together to determine another suitable date after government has re-opened for this address or for you to consider delivering your State of the Union address in writing to the Congress on January 29th," Pelosi wrote. This entry was posted in Politics and tagged Donald Trump, Nancy Pelosi, State of the Union. Bookmark the permalink.